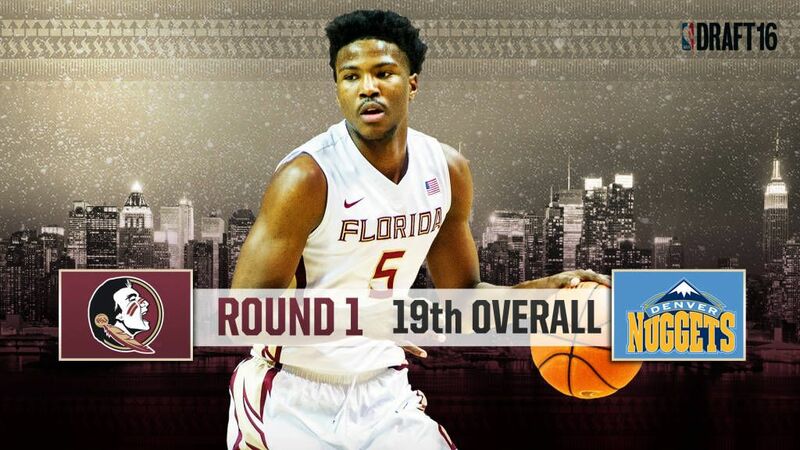 New York, N.Y. (seminoles.com) – “With the 19th pick in the 2016 NBA Draft, the Denver Nuggets select Malik Beasley of Florida State University,” said NBA Commissioner Adam Silver from the Barclays Center on Thursday night. With that pick, Beasley becomes the 11th first round NBA Draft Choice in school history and the fourth Seminole taken in the first round of the NBA Draft under head coach Leonard Hamilton. Beasley became the first Seminole chosen in the first round of the NBA Draft since Chris Singleton was selected 18th overall by the Washington Wizards in 2011 and is the first Florida State player selected in the draft since the Cleveland Cavaliers selected Bernard James in the second round of the 2012 NBA Draft. As one of 15 players invited by NBA officials to the attend the draft at the Barclays Center, Beasley became the first one and done player – he played only one season at Florida State – in school history. In being taken with the 19th pick overall, Beasley is just the seventh player in school history to be taken within the first 20 picks of the NBA Draft. Beasley’s pick is the seventh highest in school history. Beasley is the fourth first round draft choice (Al Thornton in 2007, Toney Douglas in 2009, Chris Singleton in 2011 and Beasley in 2016) under Hamilton. In his only season at Florida State, Beasley enjoyed one of the greatest seasons by a freshman in school history. Beasley scored 529 points and averaged 15.6 points scored in 34 games – the second highest point total and average by a freshman in school history during the 2015-16 season. He earned Freshman All-American, All-ACC Freshman and All-ACC Honorable Mention honors and was named to the Kyle Macy Freshman All-American team by collegeinsider.com. Beasley ranked 16th in the ACC in scoring and 25th in the ACC in rebounding making him one of only three freshmen to rank in the top 25 in both overall scoring and rebounding in the ACC during the 2015-16 season. He earned ACC Rookie of the Week honors three times as a freshman – the third highest total of any player in the league to earn the award in 2016 behind only teammate Dwayne Bacon (five) and Brandon Ingram of Duke (four). Beasley scored in double figures in the first 24 games of his career to set a Florida State record for a freshman and was only two games short of tying Stephon Marbury’s ACC record of 26 consecutive games in double figure scoring to start his career at Georgia Tech (1996). The Seminoles are fourth in the ACC in the last 13 seasons with 10 overall draft selections. Only North Carolina with 21 overall selections (including Brice Johnson and Marcus Paige in 2016), Duke with 20 selections (including Brandon Ingram in 2016) and Syracuse with 16 selections (including Malachi Richardson and Michael Gbinije in 2016) have had more players taken in the NBA Draft than Florida State since Tim Pickett was taken in the second round by the New Orleans Hornets in 2004.